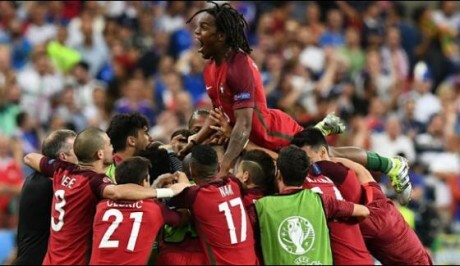 Portugal has won the final of Euro Cup after beating France 1-0. This final match was played in the Stadey de France of Paris. A good match was seen between the two teams. Both the teams attacked at goals of each other several times but failed to convert the goal. No team could score a goal in given time after which extra half hour was given. 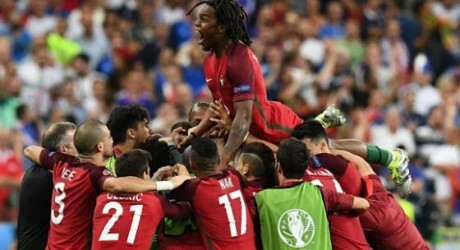 No team could score in the first half of extra time but Portugal scored first goal against France in the second half that proved decisive. In the 19th minute of second half, a French player hit the ball that was stopped by Portuguese 8th no player and gave pass to 9 no player and he hit a kick from 25 m away that could not be stopped by French goalkeeper. The goal was scored in the 109th minute of the match. This lead by Portugal remained till the end of the match. This goal is declared as the biggest goal of Portuguese football history. In the first half, Portuguese captain Ronaldo went from field due to injury. The Portuguese supporters celebrated after end of match while France was considered favorite for this match.